Since my boys are older now I have missed crafting with them but with ages also brings grandchildren so I was ecstatic when we were asked to create a project that we could make crafting with kids. As a mom with adult boys I realize now how quickly those childhood years pass and you really should capture them while you can. 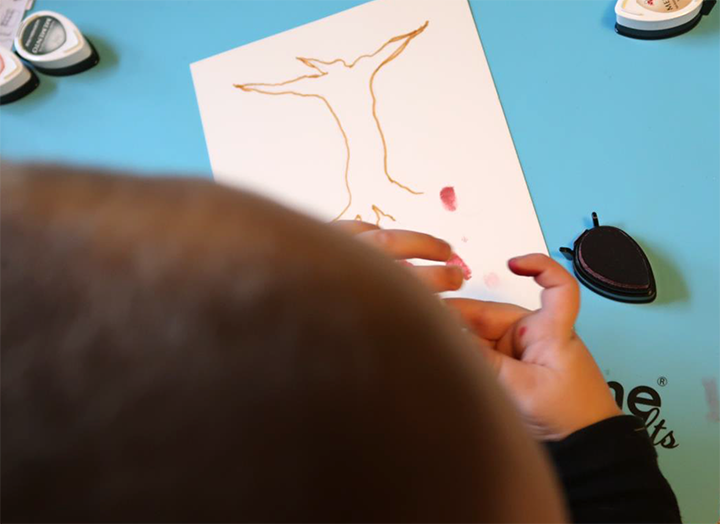 With Christmas just around the corner I thought it would be nice if Cole and I could make something memorable for his parents to capture this fleeting moment in time…hence our fingerprint memory tree. Trim a piece of watercolor paper to the desired size. Rough in a pencil sketch of the tree trunk so you know what areas to fill in with fingerprints. Pull out desired colors of Memento DewDrops and let the fun begin! I’m not going to kid you…taking pictures of this and corralling a 2 year old AND the ink pads was no easy task! So, I hope you’ll understand the sporadic photos of our crafting time. I simply opened up a bunch of DewDrops and let him go. 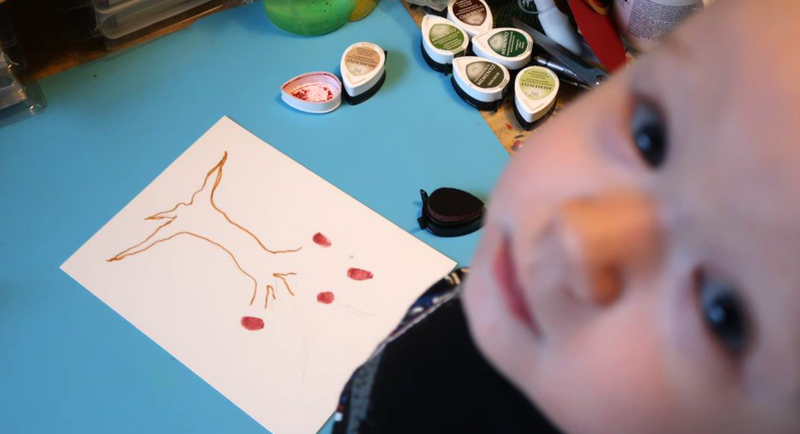 At first ,Cole was unsure about getting inky but after our first color he was having lots of fun. It was so funny; he wanted to share the colors his fingers were turning with me and my camera. After we were done adding fingerprints, I filled in the trunk of the tree with additional ink and texture using the Doodle Stix. The ground was rubbed with a few colors of green and I added some “grass” using the tips of the DewDrops. I wrote his name and age for posterity’s sake. The print was then trimmed and framed. 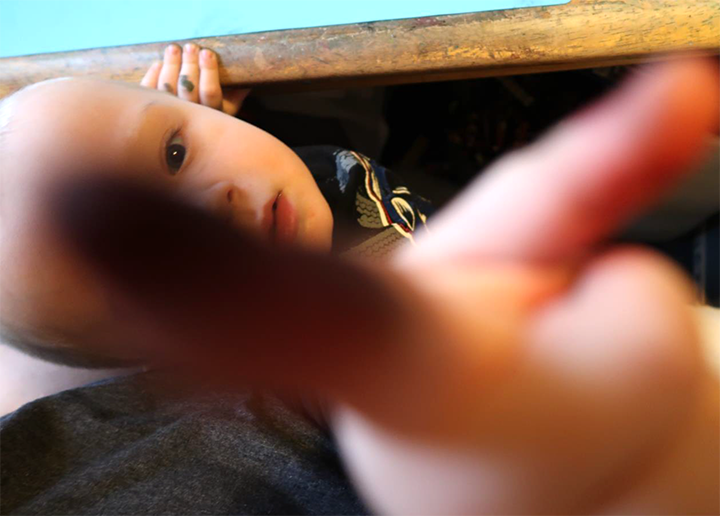 I did manage to get him slowed down enough after we were finished for probably my favorite photo of our craft time….aren’t these precious little inky hands adorable? Of course I may be a bit partial but it makes my heart swell with love. If you liked this post then please share on Facebook, Pinterest or leave a comment below! This entry was posted in Beginner, DIFFICULTY LEVEL, DIY, Holiday, Home Decor, INSPIRATION, PROJECTS, Roni Johnson and tagged DIY, DIY Inspiration, INSPIRATION, Memento, Memento Dual Tip Markers, Paper Crafting. Bookmark the permalink. Great idea and very cute Grandson! 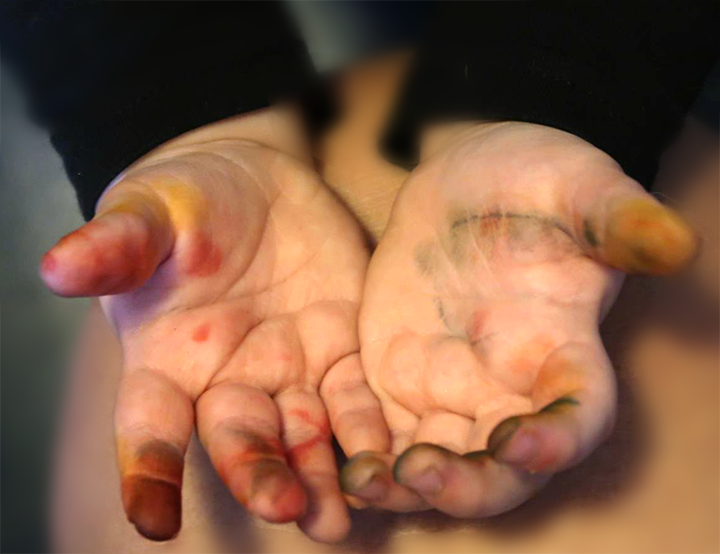 His inky hands should be an Ink Stained Grandma’s pride and joy! Oh !! The result is so fun !